Here’s a commission I did. Krampus dressed like Saint Nicholas. 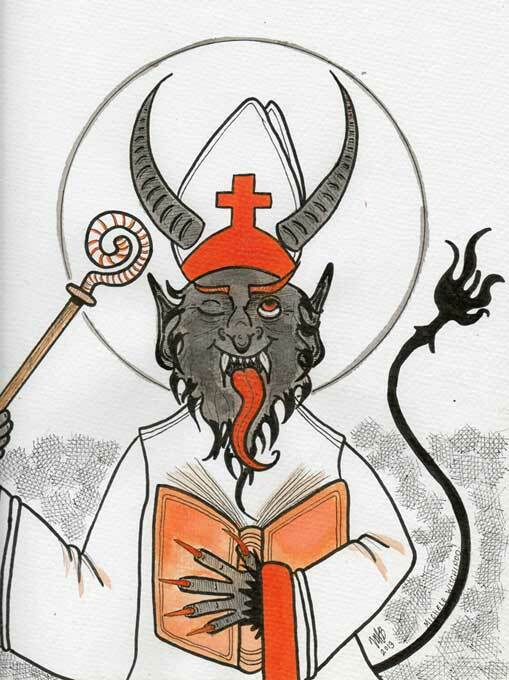 Krampus dressed like Saint Nicholas. Pen, ink, watercolor. 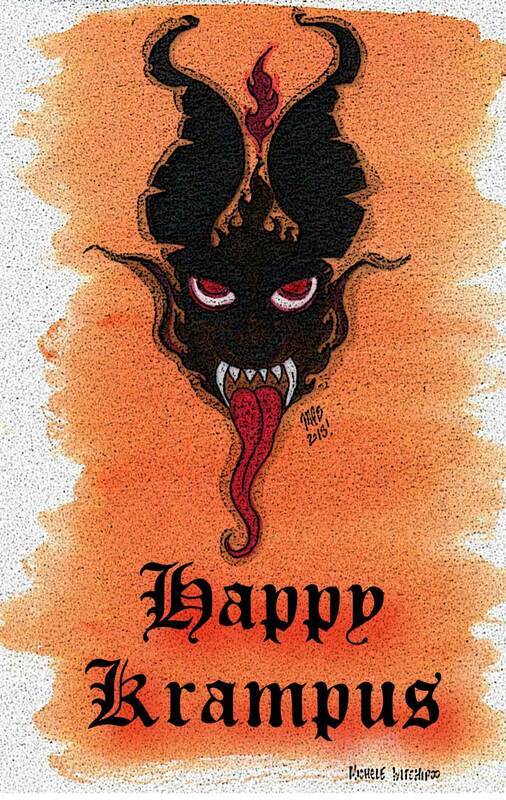 Done in Dec. 2013 by Michele Witchipoo. Commission. FYI…still taking more commissions. Email me at Witchipoo@witchesbrewpress.net. Now that the holidays are nearly over, I took a look at the Christmas tree. Now I haven’t considered myself ‘Christian’ for over fifteen years. 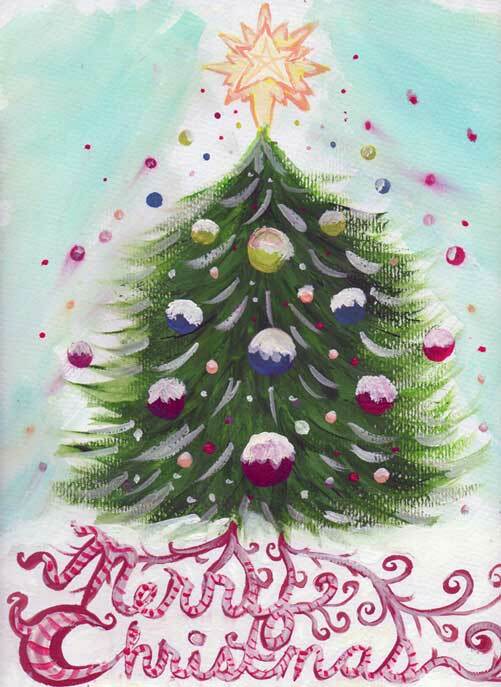 The origins of the Christmas tree actually has pre-Christian roots, pardon the pun. Regardless, the tree put out for nostalgia and tradition. As I get older, I still cannot fathom chopping down live trees for only a few weeks consumption. The smell of fresh pine might be nice. A huge bushy tree certainly looks impressive in your house. However, I personally see getting a live tree a waste of money. Not only is it frivolous, but it doesn’t look so pretty when discarded live trees are thrown out on the sidewalk curb. The only good thing in getting a live tree is that it gives people jobs. The faker the tree, the better. I like it when Christmas trees have artificial colors. Blue, silver, white, gold. Why? Why not? Anyway, in the past, I’ve enjoyed decorating Xmas trees. This year I noticed something different. When you take one of those pre-lighted trees, don’t put any decorations on it, and just plug it in…it looks fine by itself. All you have to do it put an angel or a star on top and – ta dah – you’re done. Maybe it was the result of some of the art classes I’ve taken, where you’re taught the ‘less is more’ aesthetic. There’s the desire to simplify life, not embrace so much clutter. Perhaps I just really didn’t want to go through the hassle of physically taking out the ornaments, only to put them away a few weeks later. Whatever it was…perhaps one can take this as a sign to look past life’s distractions. Instead focus at what’s really important. Either that, or I’ve realized after all this time, a lot of Xmas decor is just gaudy. Watercolor and gouache, done completely freehand without penciling. Dec. 2013. Art by Michele Witchipoo. Above is the illustration done in watercolor and gouache, done completely by freehand. No pencil work, just straight from the brush. Oh, and btw…I always found that song “Feed The Tree” by Belly to be annoying. Here’s a watercolor illustration. For those who celebrate Christmas. 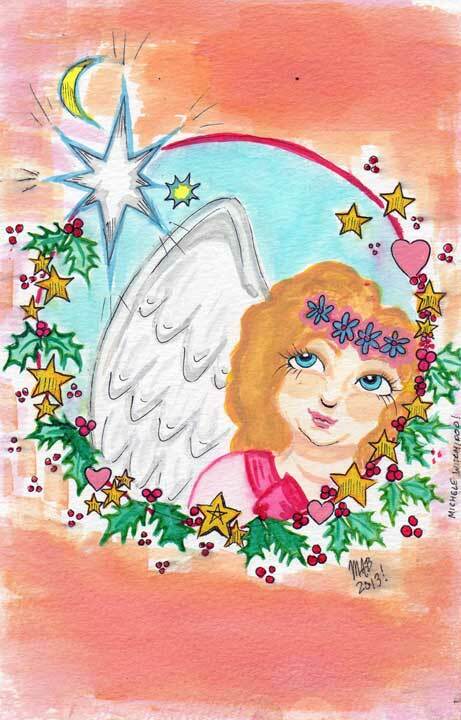 Christmas Angel Dec. 2013. Watercolor by Michele Witchipoo. Sick of the holiday cheer? Here’s some Krampus for you! Artwork and design by Michele Witchipoo. Watercolor and Adobe Illustrator. Dec. 2013. Art Exchange Program Grant v2/2013 Winners – And I’m One of Them! Hey, check it out. I won an award. A pleasant surprise indeed. It was for the Art Exchange Program Grant v2/2013. I’m one of the winners.